This is part 2g of the translation of my treatise Jesuspassagerna hos Josefus – en fallstudie into English. 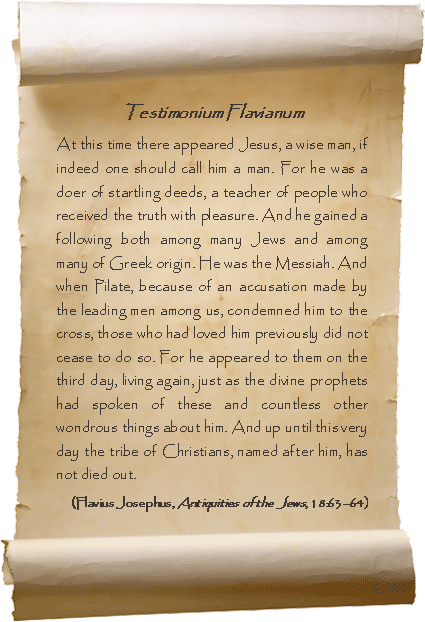 Another circumstance which makes it less likely that the Testimonium Flavianum originally was present in Josephus’ Antiquities of the Jews, is that not a single Church Father before Eusebius refers to the paragraph. Testimonium Flavianum is not quoted in any form in the surviving works of Melito of Sardis (died c. 180), Theophilus of Antioch (died c. 185), Irenaeus of Lyons (c. 130 – 202), Minucius Felix (active in the late 2nd or first half of the 3rd century) and Clement of Alexandria (c. 150 – 215), all of whom probably wrote during the second century. Nor do we find any references to the Testimonium in Tertullian (c. 160 – after 220), Julius Africanus (late 2nd century – c. 250), Pseudo-Justin (probably active shortly after Africanus), Hippolytus of Rome (c. 170 – 235), Origen (c. 185 – c. 254) and Cyprian of Carthage (c. 200 – 258), all of whom were active during the third century. Finally, we have those who were active in the fourth century but before Eusebius and do not refer to the Testimonium, then Methodius of Olympus (died c. 311), Arnobius the Elder (active c. 284 – 305) and Lactantius (c. 240 – c. 320). 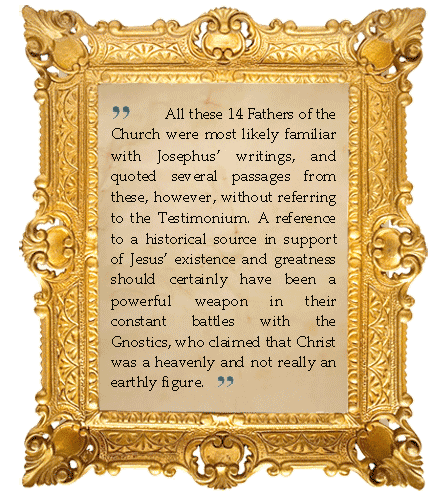 All these 14 Fathers of the Church were most likely familiar with Josephus’ writings, and quoted several passages from these, however, without referring to the Testimonium. Further details of the Fathers and others’ knowledge of the writings of Josephus are given in the following footnote. A reference to a historical source in support of Jesus’ existence and greatness should certainly have been a powerful weapon in their constant battles with the Gnostics, who claimed that Christ was a heavenly and not really an earthly figure. In this position, one indeed expects Justin to offer a strong counter-argument, and one could hardly imagine a more compelling argument against a Jew’s claim that Jesus never existed, than (like later times Church Fathers) to refer to Josephus, another Jew who was born in Jerusalem only a few years after Jesus according to Christian beliefs should have been executed there. But nothing of the kind occurs. The objection usually made against this argument is that Christians in general were not particularly familiar with Josephus and especially not with the second half of the Antiquities of the Jews. The argument is that in those instances where these early Church Fathers make use of Josephus, they primarily use the Jewish War and Against Apion. It is therefore alleged that many of the Fathers probably did not know of the Antiquities of the Jews and accordingly also was ignorant of the Testimonium; and that the first person to demonstrate deep knowledge of Josephus is Origen. This is however an illogical argument, since Christians hardly lived in isolation from each other. Surely some Christians must have known what Josephus said about Jesus in the Antiquities of the Jews (if he would have written anything), and then also have told others about it, in order for the information to spread within its own ranks. To believe that all these Church Fathers were familiar with Josephus’ works, however, not with the only work in which Jesus is mentioned, is indeed a naive notion. 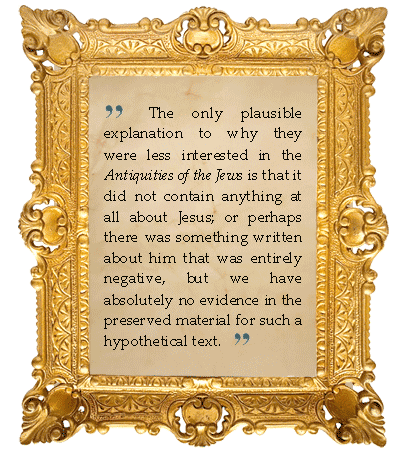 The only plausible explanation to why they were less interested in the Antiquities of the Jews is that it did not contain anything at all about Jesus; or perhaps there was something written about him that was entirely negative, but we have absolutely no evidence in the preserved material for such a hypothetical text. “No form of the Testimonium Flavianum is cited in the extant works of Justin Martyr, Theophilus Antiochenus, Melito of Sardis, Minucius Felix, Irenaeus, Clement of Alexandria, Julius Africanus, Pseudo-Justin, Tertullian, Hippolytus, Origen, Methodius, or Lactantius. According to Michael Hardwick in Josephus as an Historical Source in Patristic Literature through Eusebius, each of these authors shows familiarity with the works of Josephus.” (Peter Kirby, The Testimonium Flavianum). Heinz Schreckenberg presents evidence that the following Church Fathers living before Eusebius were familiar with Josephus: Pseudo-Justin, Theophilus of Antioch, Minucius Felix, Irenaeus, Clement of Alexandria, Julius Africanus, Tertullian, Hippolytus, Origen, Methodius of Olympus, and Pseudo-Eustathius (who however, wrote about the year 400). (Heinz Schreckenberg, Die Flavius-Josephus-Tradition in Antike und Mittelalter, 1972, p. 70 ff). According to Heinz Schreckenberg, Theophilus uses Against Apion, and he also refers to the Jewish War. “With a probability, bordering to certainty,” Melito of Sardis refers to Jewish War 6:201–213, and his implicit allusion presuppose that his readers would be so familiar with Josephus that they would understand what he alluded to. Irenaeus uses the Antiquities of the Jews 2:238–253. Minucius Felix refers to “the works of Flavius Josephus” in Octavius 33:4–5. Clement of Alexandria knows “the Jew Flavius Josephus”. He refers to both the Jewish War and the Antiquities of the Jews. Tertullian “uses Josephus here and there” and refers explicit to Against Apion. Hippolytus’ (died c. 235 CE) account of the Essenes in Refutatio Omnium Haeresium 9:18–29 is very similar to what occurs in Jewish War 2:119–166. Julius Africanus uses at least book 12 of the Antiquities of the Jews, but Africanus’ work is mainly lost. Origen knows all of Josephus’ works. Methodius of Olympus (died 337) refers to the Jewish War 6:435–437. Pseudo-Eustathius uses both the Jewish War and the Antiquities of the Jews. (Heinz Schreckenberg, Jewish Historiography and Iconography in Early and Medieval Christianity, 1992, p. 53–63). Origen, On Matthew 10:17, Against Celsus 1:47 & 2:13. Actually, Origen’s verbiage in the alleged quotes of the famous Jamesian passage (Origen, On Matthew 10:17, Against Celsus 1:47 & 2:13 seem to indicate that there was yet another place within Antiquities that credited the destruction of Jerusalem to ”the death of James, the brother of Jesus, the so-called Christ”. But if the additional veribage was in the Christians’ copies of Antiquities (it certainly would not be in the Empire’s or the Jews’ copies), those copies perished in one of the persecutions toward the end of the Third Century CE and it was up to Eusebius to figure out where to insert the necessary verbiage! On the other hand, Origen could have made it all up.